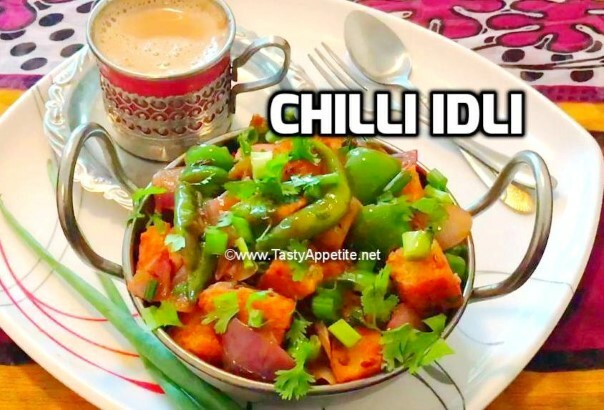 Chilli Idli fry is one of the very popular Indo Chinese dish that tastes divine with a combo of onion raitha. It tastes mildly spicy with inviting aroma, that both kids and adults enjoy for dinner or as an appetizer/ starter. This fusion dish can be prepared easily at home in a healthier way than that of restaurants. Check out this easy recipe & enjoy weekend dinner with your loved ones! Slice soft idli to cubes. Heat oil in kadai / frypan. Add the idli pieces and deep fry until golden & crispy. Drain in kitchen tissue and set aside. Add green chilli, cubed onions, capsicum and toss. Add cumin pwd, red chilli pwd, salt, garam masala pwd, red chilli sauce, soy sauce and tomato ketchup. Toss good in high flame. Add fried idlies and saute. Add finely sliced coriander leaves and spring onions. Lipsmacking delicious chilli idli is ready!